Giving military retirement gifts to those that have served in the armed forces is a great way to honor and thank them for the time they gave to their country. Good military retirement gift ideas can help you make the perfect selection. Within each branch of the service there are many special and elite forces and units. Many retirement gifts represent these specialized forces or units. The following are the more well known areas of the special forces. Having a military retirement gift personalized or engraved is a way to add a special extra touch. The engraving could include the retiree's name, branch of service or military rank. Other engraving choices might be the dates the person served in the military, a short message or the retiree's initials. The following are a few examples of beautiful personalized gift ideas for military retirees. An elegant wooden presentation box with the recipient's name affixed to an engraved gold plate holds a Colibri Military Medallion Pocket Watch. The emblem of the retiree's branch of service is beautifully represented on the pocket watch case. This beautiful throw blanket features the United States Department of the Navy seal. The throw can be personalized with up to 26 characters. It is also available for Army, Army National Guard, Marine Corps and Air Force. These blankets are offered from Keepsakes Etc., which also carries many other excellent military retirement gifts including wall hangings, blankets and pillows. If you're looking for a gift for a retired member of the Coast Guard, you'll find some great ideas at All American Gifts. Consider a shadow box, a medal display case, or a sword plaque. You can have some items personalized for an even more meaningful gift. Many gift givers choose retirement gifts for military personnel that focus on a special hobby or leisure activity the retiree enjoys. Special hobbies could include model ship building, painting or collecting a particular item associated with their branch of service. Some seniors might also enjoy golf, reading or playing chess. A beautiful oak handmade military collectible coin case is a special gift for a collector. All American Gifts also makes flag, medal and award cases, as well as display plaques and cases for swords. Any item can be personalized with a beautiful custom laser engraved plague. Military chess sets for chess lovers offer sets from battles such as the Civil War and Pearl Harbor. Prices vary from about $150 to $1,200 depending on the set and materials. Give your favorite Navy or Coast Guard retiree a model ship building kit. Ship and boat enthusiasts will find an array of military ships and boats from all over the world. Give the golf lover in your life a personalized golf putter with a military design made from gorgeous woods. Wood choices include cherry, pear, and walnut and you can choose a seal from any military branch. Cost is around $120. 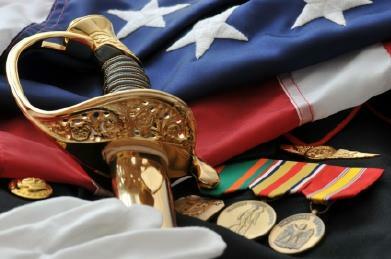 Many websites specialize in retirement gifts that could be used to honor military retirees from each branch of service. Framing Achievement offers high end wood frames. Memorable Gifts offers personalized military gifts. Relic Wood offers wooden military insignia items such as humidors and keepsake boxes. Military retirement gifts are a special way of paying tribute to servicemen and women. Make your gift one that is unique and meaningful for your favorite retiree. It will be appreciated, treasured and may even become a future family heirloom.